When it comes to quality siding for your home, Windows Hawaii is solid to the core. That's because our team of professional installers works with premier brands such as Celect, Exteria, Craneboard, and James Hardie insulated siding. When you side your home with Windows Hawaii service and products, you can count on a commitment to quality and durability that will last a lifetime. Whether you choose CraneBoard for vinyl siding, or James Hardie for fiber-cement, your home will benefit greater curb appeal, efficiency and protection from the outside elements. Curb Appeal: Give your home a classic, crisp-looking exterior with new siding. CraneBoard vinyl siding is the 21st century version of a time-tested surface that works in beautiful harmony with accents of stone, shake and board, or can be used to cover an entire façade with smooth integrity. The milled cedar grain gives an appearance and texture of natural wood, and will give your house a solid, authentic presence. For those looking for the durability and protection of fiber-cement, we offer Hardie siding in a variety of colors and styles. Hardie board gives the beauty and texture of wood, but the protection of a material that will not weather or deteriorate like wood in our climate. Our siding is all natural, non-toxic, non-combustable renewable materials that create durable alternatives to wood siding. Maintenance Free: Craneboard is built to last and is virtually maintenance free, never needing to be painted. 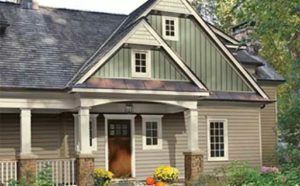 You can mix and match from a selection of nine colors of Craneboard vinyl siding, with complementary accessories and trim to create a truly distinctive look for your home. Hardie fiber-cement siding resists damage from sun, salt and rain. It is warranted not to rot, warp or delaminate, a problem with some other siding materials that have been used in Hawaii. It can withstand winds up to 150 mph. You can rest assured that storm after storm, season after season, the weather outside is not affecting your siding. You can paint Hardie siding any color you choose or use the ColorPlus technology which is more durable than regular paint. Go Green: With Craneboard insulated siding, your home becomes upgraded to a 4.0 R-Value and Energy Star® rating, which is four times the efficiency and insulating power of ordinary vinyl, wood or fiber cement siding. You won't pay a premium for selecting eco-friendly siding for your home. Outside elements. Whether noise, impact or termites, our siding options are built to help shield your home. All brands we carry are constructed to withstand more impact than ordinary siding. Another benefit? Sleep more soundly with up to a 45% reduction in noise. And finally, keep the bugs out with new siding that is specially manufactured to help repel termites and carpenter ants. Exterior vinyl siding replacement is a great opportunity to improve critical home energy performance and increase its overall value.